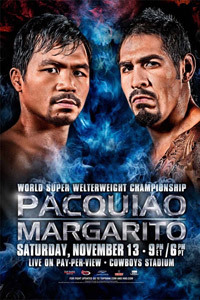 Agcon Online » Blog Archive » Will Pacquiao Make A Margarita Out Of Margarito? Will Pacquiao Make A Margarita Out Of Margarito? I have not been keeping up with the Pacquiao saga lately, but all signs indicate Margarito is toast in the upcoming fight as analyzed by ESPN’s 12 Rounds. Margarito got an advantage physically on paper. Hopefully, Pacquiao is focused enough to knock him out. The showdown will be in Cowboys Stadium in Dallas, Texas on Saturday night (November 13, 2010). Will this be the fighting congressman’s last fight? Perhaps the outcome will decide it. There’s always a chance the ‘big’ Margarito will beat the ‘little’ Pacman into a pulp. But then again, David terminated Goliath with one, clean hit. 12:05 pm	and is filed under boxing, sport. You can follow any responses to this entry through the RSS 2.0 feed. You can leave a response, or trackback from your own site.